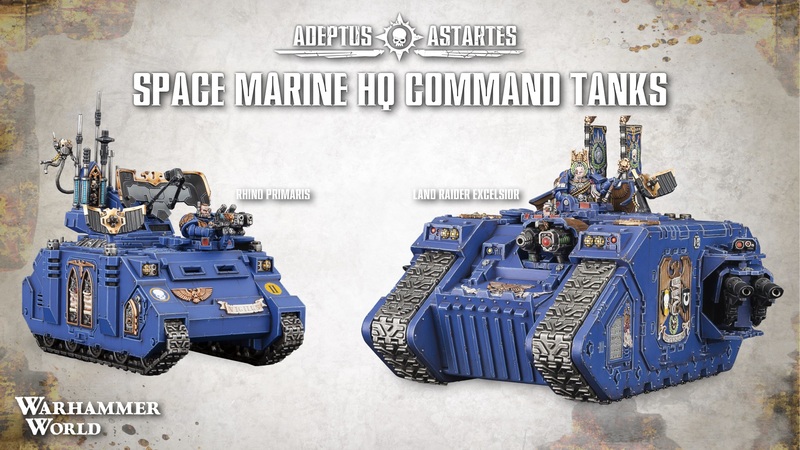 Check out the new Space Marine HQ Command Tanks – The Space Marine Rhino Primaris and the Land Rider Excelsior! These are exclusively available from Warhammer World in Nottingham. The rumours has the kit priced at £75 and it contains one sprue with the upgrades for both command tanks. Apparently one can choose from the Space Marines, Dark Angels, Blood Angels or Space Wolves when buying the kit. Both tanks are taken as one HQ slot but will move and act as separate units in game. The Rhino Primaris comes equipped with an Orbital Array which can be used to bring in a unit from reserves or to call in an orbital strike. It also has servo-skull upgrade which can give units a selection of special rules once per game per rule. It has a carry capacity of 6 and comes with a twin linked plasma gun. The Land Raider Excelsior has an Aquila Aegis which basically gives it extra armour and a Invulnerable save. Like the Rhino it can bestow a special rule on a nearby unit. It comes with 2 twin linked lascannons and grav cannons and can take a combi plasma and grav gun. 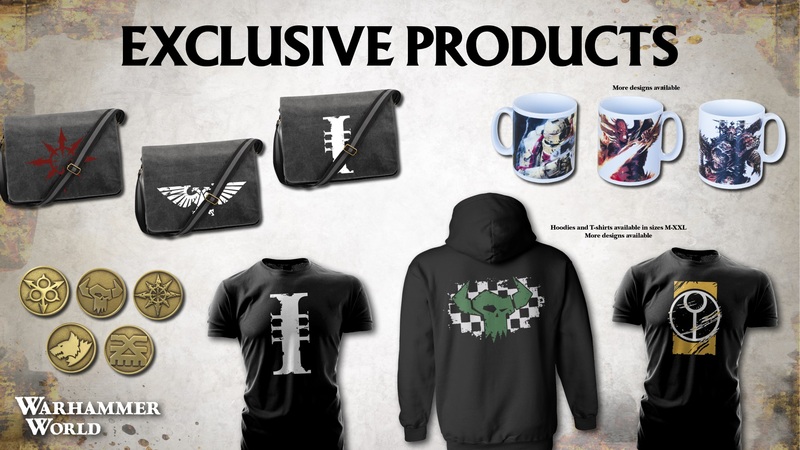 Other exclusives from Warhammer world includes satchel bags, metal pin badges, mugs, T-shirts and hoodies. All these will be available this weekend with the grand opening of Warhammer world. All these will also be availble from Monday 18th of May for those who didn’t get a ticket for the opening. 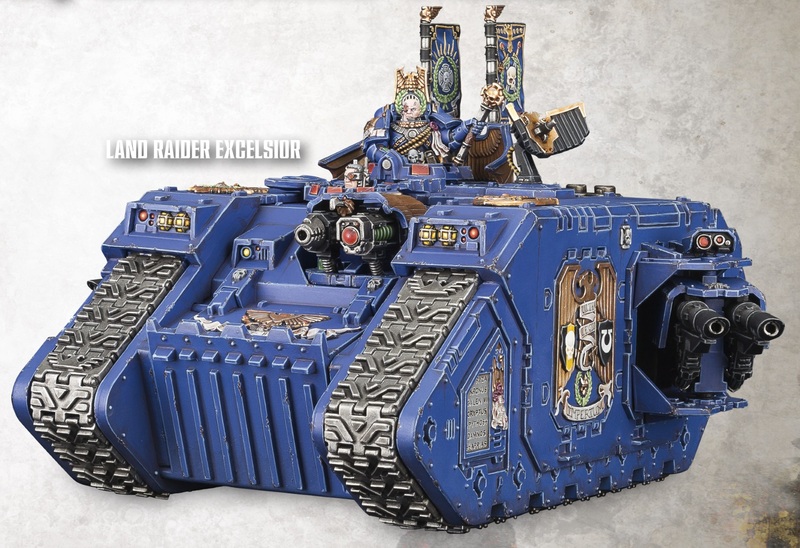 Quite like the blinged up tanks but I have to say I am getting extremely tired of seeing the Ultramarines colour scheme on almost every model ! 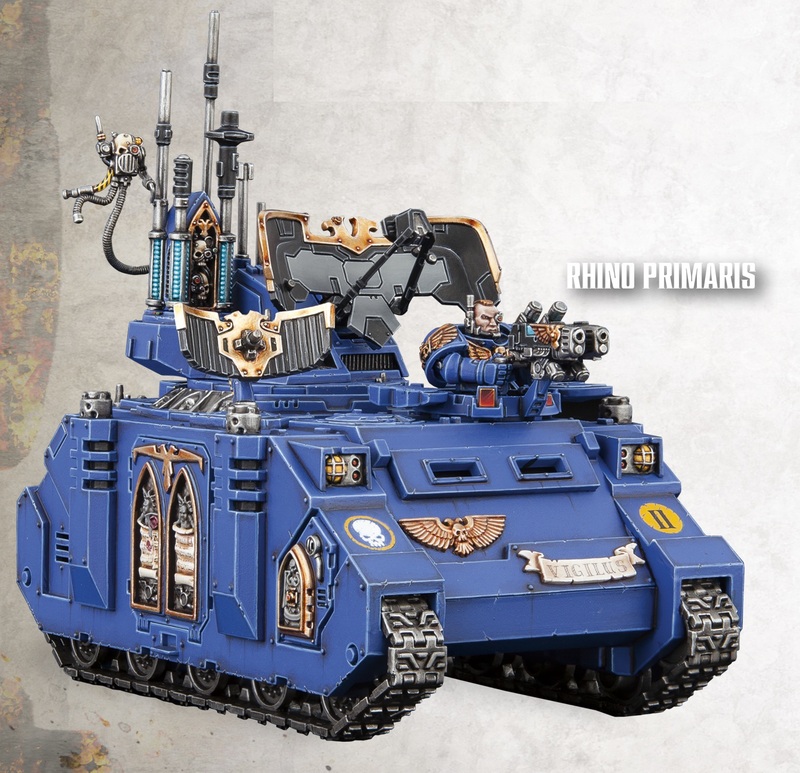 I really like the Land Raider one, the Rhino looks a bit crowded to me 😉 And yes it would be a nice to see them in some different schemes, my picks would be for Black Templars and something like the Emperors Children’s scheme.